Celebrations and food – they go together, don’t they? In our home they do! On New Year’s day when talking on the telephone to my mother, she asked us what we planned eat for the day. She was a little taken aback when I told her I planned to cook lunch and dinner and suggested we go out or order in. Julia Child, the celebrity chef and cookbook author said: “I was 32 when I started cooking; up until then, I just ate.” Well, I’ll have add 10 years to Julia’s statement- I was almost 42 when I really started cooking and that explains my mother’s surprise, I guess! But José is an absolute foodie and it has completely rubbed off on to me. So we had our New Year’s menu planned at least four days before 1st January. Yes, Cafe 7Eight believes in planning sometimes and here’s what I turned out. Lunch consisted of Portuguese pork chops. This is something I remember my Mum making and we all loved it. 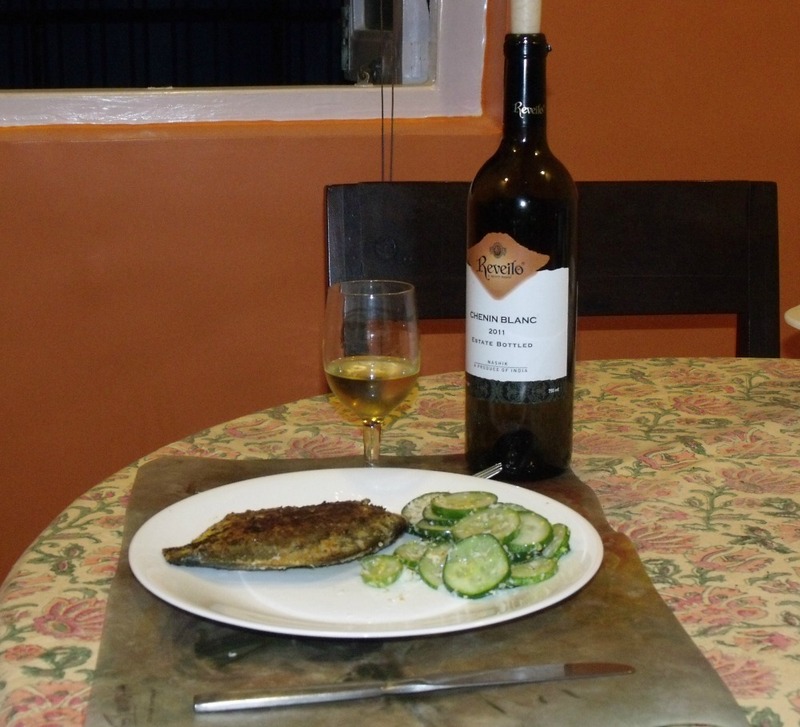 Pork chops marinated with rum, garlic and chilli flakes….my mouth is watering even as I write this. We normally avoid red meat – eating healthy as we do – so it’s only on special days that we indulge. However, we always ensure that we have plenty of vegetables – either raw or cooked – to balance the meat. So we had a big cabbage and green apple salad with a ginger vinaigrette. Two pork chops apiece, loads of salad and a bread roll – made quite a meal. Most days, including special ones, we eat home cooked food, but off and on we get lazy or we want something special that we don’t have the ingredients for or the inclination to cook. That’s when Food Panda comes to our rescue now. Have you tried it out? It’s an easy way to order food online anytime, anywhere. All you need to do is go to the Food Panda website and enter your city and location and a whole lot of options for restaurants in the vicinity pop up. For example, if you’re in Mumbai and located in Colaba, you’ll have all these restaurants show as options. You decide which restaurant you want to order from, browse the menu and select what you want to order. 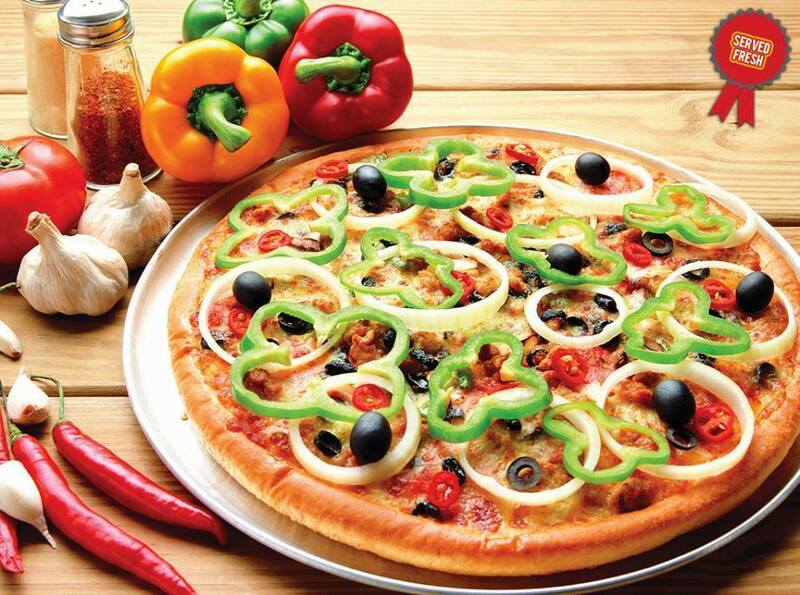 Tonight is celebration time – it’s Republic Day in India and the eve of our wedding anniversary – so it is Smokin’ Joes – we believe that they give the foreign pizza brands a good run for their money – and with less cheese if you say so. Our pizza choices included – Woodcutter – spinach, onion, mushroom and basil; Hot chicken – spicy chicken and cheese and Barbecued chicken – chicken, mushroom and onion. Since most restaurants in Mumbai, have a cash on delivery only option, it’s a big plus to order our pizzas (or other food) via Food Panda, since we pay by card. We got an email to confirm our order, followed by a confirmation SMS from the restaurant. And our pizzas arrived in quick time, yummy as usual, with no extra delivery charges for ordering online. I would love to hear your how food forms part of your celebrations of special occasions in your home. Belated Anniversary wishes, Corinne and Jose! Your great recipes and photos have made me really hungry now. Oh so much! Both as a Filipino and Franciscan at that ~ food is so much part of special occasions esp. that a celebration is one way of putting people/families/friends together. Sharing meal is sharing life! Oh So someone had a smoking anniversary 🙂 I just loved your post ..Although I am a vegetarian but you managed to water my mouth with the description of your pork chips and fish fries. I loved the spread and salads I am going to try for sure. My mouth was watering as I was reading this and the food pics look yummy. Pomfrets another favourite of mine. Food is an integral part of our celebrations too. Anniversary wishes to you and Jose. Ah, a post after a while from the great Cory. And what a drool-worthy one 🙂 Loved it. Hope you and Joe had a fantastic anniversary celebration ! Sometimes despite our best healthy living intentions we need a break from food prep. You have Food Panda and in NYC where I live, we have Delivery.com. Thank goodness for it. I can search by type of cuisine and find my favorite Indian, vegetarian or vegan restaurants. A few clicks and within an hour, the meal of choice is at my door. Considering that I am such a terrible cook, there’s not much experimenting that I do anyway. Nice celebration, Corinne! Wishing you and Jose a very happy anniversary! Corrine, you’ve got me absolutely hungry and it’s almost time for dinner. I know what I’ll be having! Happy Anniversary Corinne! And btw that fish looks gorgeous! Yum! What’s a celebration without food! I love pork chops. Happy Anniversary wish you wonderful years together. Wishing you many more blissful years with Jose, Corinne! That’s nice too, Ruchira. I remember seeing a picture of your family celebration recently too! Mmmm… this post made me hungry! Happy Anniversary to you both! Oh, you already know what foodies Danny and I are! 🙂 Loved your photos and descriptions of these tasty meals. You had my mouth watering, too! And, Happy and Blessed Anniversary to you both! Love and blessings! Happy Anniversary Corinne and Jose! Many more years of togetherness!! The pork chops and fish fry sound and look so yummy 😀 Grand!! This is so cool! I discovered Food Panda last year – and through them we discovered a lovely restaurant that home delivers food. We are not big fans of eating out either but once in a while it is a good idea. Invariably it is pizza from Pizza Hut thanks to one particular family member loving it. Hugs…may your life always be full of happiness, health and joy! I gave you the recipe by post – will share it on the blog soon, Vidya.